A homemade Italian ice from La Guli Pastry Shop on Ditmars Boulevard. 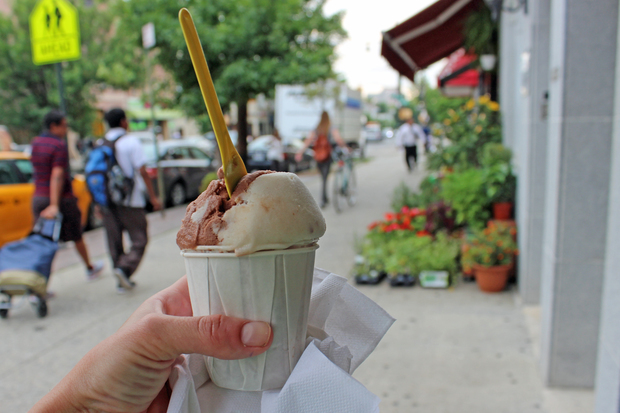 ASTORIA — In a neighborhood known for its plethora of food options, ice cream is no exception. From ice cream sandwiches to homemade Italian ices, here's DNAinfo's pick of seven places in the neighborhood to grab a frosty cone or a cup to help you stay cool this summer. Looking for more ways to beat the heat? Check out our roundup of the best frozen treats in Queens. ► Igloo Cafe, 2226 31st St. The dessert menu at this cafe near the Ditmars Boulevard subway station includes decadent ice cream sundaes, loaded with toppings. You can make your own, go for a classic banana split or try something like the Cookie Supreme — two scoops of cookies-and-cream ice cream and one scoop of cookie dough ice cream topped with hot fudge, whipped cream and Oreo cookie bits. ► La Guli Pastry Shop, 29-15 Ditmars Blvd. A neighborhood bakery that's been open since 1937, La Guli's serves its gelato year-round and also offers homemade Italian ices in the summer. Their ices are so popular that one longtime customer who'd moved out of state once paid to have the treats shipped all the way to Las Vegas, according to the owner. ► Sweet Janes, 27-17 24th Ave. This ice cream shop makes nearly all its frozen treats in-house, and has both vegan and gluten-free options in addition to its standard ice cream offerings. The diet-conscious can try one of their Fudgestickles — Sweet Janes take on a fudge pop which is dairy-free and just 150 calories. The bakery next door to the popular Omonia Cafe offers an array of desserts, including ice cream and more than 20 flavors of gelato. ► Astoria Coffee, 3004 30th St. This neighborhood cafe is a great place to get your caffeine fix and fulfill those sugar cravings: the coffee shop is offering ice cream sandwiches for the summer from Melt Bakery on the Lower East Side. ► Victory Sweet Shop, 21-69 Steinway St. This bakery has been around since 1968, and now has a cafe and garden next door where the dessert menu includes ice cream with toppings like cookies, fruits, nuts and chocolate or cherry syrup. ► Fresk'o Yogurt, 31-19 30th Ave. While not technically ice cream, Fresk'o offers Greek frozen yogurt as well as traditional froyo that you can serve yourself, along with a medley of fun toppings.